Are you looking for different ways to do your job better on a scissor lift? A British company, Aerial and Handling Services (based in Smalldole), just announced a new DRXmulti materials handling attachment, specifically designed for scissor lifts. The great thing about this attachment is the versatility; it can be installed on every make and model of scissor lifts (United States, Great Britain and elsewhere), including low level access platforms such as Pop-Ups or Power Towers. Weighing about 30 pounds, the fully device can be positioned in under five minutes and removed in less than 60 seconds. The accessory should be a great fit for scissor lifts at manufacturing plants and other industrial settings. It will also be a sought-after attachment for scissor lifts at construction sites, because it can function as a pipe & rebar rack or a board carrier. All the user has to do is change the jaws for clamps and add board cups. 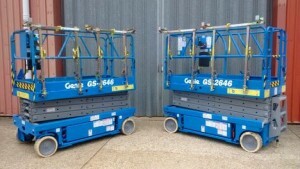 The first two devices have already been used by Bam Ferrovial Kier (BFK) and fitted on two Genie GS2646 scissor lifts. They’ll help with a curtain wall at London’s Farringdon Station. With product updates and other equipment issues, you have to stay current on how that impacts scissor lift safety. CertifyMeOnline.net is your go-to source for top-tier training at low prices. Our courses are packed with OSHA compliant content, so you can be sure you’re getting the best training! 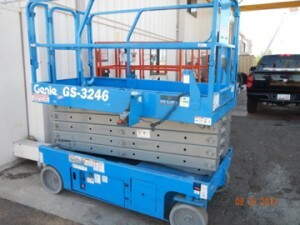 This entry was posted in Scissor Lift Training on September 24, 2014 by admin. 99% of the time, aerial lifts are used for typical on-the-job tasks. If you’ve ever been in an aerial lift or know someone who spends a lot of time in one, it’s probably for things like painting, maintenance, construction work, electrical contracting and other similar jobs. Security. That’s correct – for large crowd control (college football games, music concerts, etc. ), aerial lifts can be used to give security guards and police a “bird’s eye” view of what’s happening below. East Carolina University recently used aerial lifts in their home football opener. Getting pets out of trees and off of rooftops. Aerial lifts can be used to help rescue those adventurous pets go get a little TOO adventurous. Sure, they still use fire truck ladders, but aerial lifts can also do the trick! Installing mega-sized Christmas trees. The world’s most famous Christmas tree, in New York’s Rockefeller Center, was put in with the help of a massive aerial lift during last year’s holiday celebrations. Setting basketball hoops in place. In order to measure a basketball rim exactly 10 feet off the floor, aerial lifts are used to both measure and balance rims. Hey, not everyone is LeBron James – sometimes an aerial lift can help get people way up in the air! For both unique and everyday aerial lift tasks, you’ll need the right training to stay safe on the job. CertifyMeOnline.net, the leader in online aerial lift training, is a great choice for small and large companies. Our OSHA compliant content can be taken at your convenience, and our pass rate is 100%. So if you’re looking to get your credentials, look no further. CMO also has trainer instruction, scissor lift courses, training packages and more. Check out the CMO contact page for more information. If you’d like to speak with our training specialists, please call (602) 277-0615. We’re happy to help with any and all of your aerial lift training needs. Thanks for stopping by the CMO blog – and check back for more updates! This entry was posted in Aerial Lift Training on September 15, 2014 by admin. Scissor lifts are usually used to elevate workers for painting, repairs and other jobs. But East Carolina University (Greenville, NC) is taking a different approach. ECU recently announced that they’ll be using scissor lifts to upgrade their safety and security at Dowdy-Ficklen Stadium, the home field for their football team, known as the Pirates. Police at ECU have come up with a better way to keep an eye on the crowds, both in the stadium and afterwards, when everybody leaves. ECU opens their regular season against North Carolina Central University, and university officials think everything will run more smoothly thanks to a new tool – scissor lifts, of all things! “Safety is our number one priority and while we want to see the Pirates win, we don’t want to be the story after the game we want the Pirate win to be the story,” said ECU Police spokesperson Lt. Chris Sutton. Along with EMS stations located around campus, law enforcement officers will man tailgating areas on the ground and up high in scissor lifts. “That scissor lift is a way to have eyes above the crowd to help should we see a need where we need to try and disperse or move the crowd,” said Lt. Sutton. Nearly 150 officers will be on duty at Saturday’s game, which is set for an 8:00 PM kickoff. This is interesting news, as it relates to potential jobs for scissor lift operators. A police officer with proper scissor lift training could have an inside track on finding a job for crowd security, surveillance and more. CertifyMeOnline.net is the #1 online option for getting all the scissor lift certification and training you need. Our courses also include fall protection, aerial lift instruction and more. The ECU officers will require OSHA-compliant training, and CMO is the perfect choice! For more on how to get OSHA certified, go to the CMO contact page or call our safety specialists at (602) 277-0615. We can get your training off the ground (no pun intended)! Thanks again for reading the CMO blog. This entry was posted in Aerial Lift Certification, Scissor Lift Training on September 3, 2014 by admin.